Give a colony of garden ants a week and a pile of dirt, and they'll transform it into an underground edifice about the height of a skyscraper in an ant-scaled city. Without a blueprint or a leader, thousands of insects moving specks of dirt create a complex, spongelike structure with parallel levels connected by a network of tunnels. Some ant species even build living structures out of their bodies: army ants and fire ants in Central and South America assemble themselves into bridges that smooth their path on foraging expeditions, and certain types of fire ants cluster into makeshift rafts to escape floods. How do insects with tiny brains engineer such impressive structures? Scientists have been studying the social behavior of ants and other insects for decades, searching for chemical cues and other signals that the insects use to coordinate behavior. Much of this work has focused on understanding how ants decide where to forage or build their homes. But new research combining observations of ant behavior with modern imaging techniques and computational modeling is beginning to reveal the secrets of ant construction. 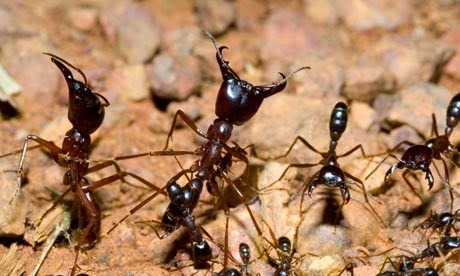 It turns out that ants perform these complex tasks by obeying a few simple rules. "People are finally starting to crack the problem of producing these structures, which are either made out of soil or the ants themselves," said Stephen Pratt, a biologist at Arizona State University. The organization of insect societies is a marquee example of a complex decentralized system that arises from the interactions of many individuals, he said.